Mumbai: Jignesh Gala is an active investor in initial public offers (IPOs), but he has given recent offers from companies such as Coffee Day Enterprises Ltd (CDEL) and InterGlobe Aviation Ltd a miss, as he says the companies didn’t leave enough on the table for investors. For now, Gala prefers parking his money in the secondary markets, where he believes one can find scrips that offer value. Gala’s views are in keeping with the lukewarn response to IPOs from retail investors this year. There have been 16 IPOs this year and seven of these have seen the portion set aside for retail investors remain undersubscribed, according to data from Prime Database, a firm that tracks the primary markets. 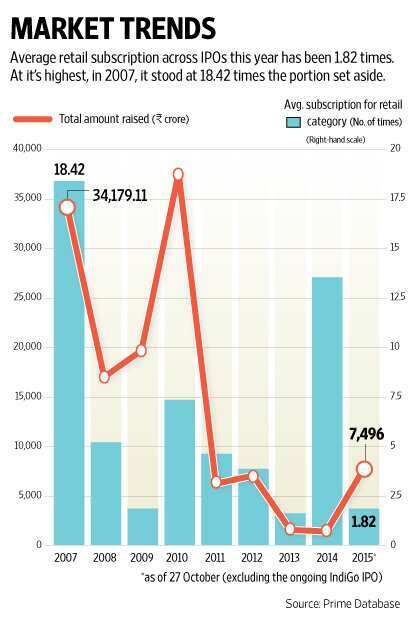 The average retail subscription across IPOs this year has been 1.82 times; ₹ 7,496 crore has been raised through primary offerings so far this year. At it’s highest, in 2007, when companies raised ₹ 34,179 crore, average retail subscription was at 18.42 times the portion set aside. In 2010, a year when companies raised the most ( ₹ 37,555 crore) through IPOs, average retail subscription was 7.33 times. To be sure, there have been years such as 2013 and 2009, when average retail participation was lower than this year at 1.53 and 1.8 times, respectively. “Retail investors typically come into IPOs in large numbers only when the QIB (qualified institutional buyers) subscription is very strong. Retail, by and large, cannot take a call on a company or its price. They, therefore, seek the validation of QIBs," said Prithvi Haldea, chairman of Prime Database. “Also, if there is an IPO boom happening when all recent issues get listed at a premium, retail investors just join the party as they do not want to be left out," he added. Data supports that argument. Among the 15 IPOs that have started trading on the exchanges, only about half ended the first trading day with gains. The steepest gains were seen in the case of VRL Logistics Ltd, which closed with gains of 43% on day one—that’s still far short of the listing day gains seen in 2007-08. Firms such as Burnpur Cement Ltd, Everonn Education Ltd and Allied Computers International (Asia) Ltd which debuted then saw listing-day gains of 286.3%, 241.8% and 214.2%, respectively. “Retail participation was high in the years 2007 and 2008 on the back of a bull market run of four to five years. In comparison, 2015 is just the first year of the revival in the IPO market and if we are able to sustain the current momentum in the market for the next 12 months, then we should see retail participation increase gradually," said Ajay Saraf, executive director at ICICI Securities Ltd. He added that over the last 12 months, retail money has also moved more towards mutual funds. “Pricing, too, is an important factor in attracting retail investors to IPOs. The issues which are attractively priced will see strong retail participation," he said. Among recent issues, CDEL, which runs India’s largest cafe chain Café Coffee Day, recently saw its ₹ 1,150 crore offer being subscribed 1.8 times. Shares set apart for institutional investors were subscribed 4.38 times in the three-day initial public offering, but the retail and non-institutional investor categories were subscribed 90% and 53%, respectively. On day 1 of its IPO, InterGlobe, owner of India’s most profitable airline, IndiGo, which is raising over ₹ 3,000 crore through the largest share sale in the country since 2012, saw a 87% overall subscription. The portion for QIBs was subscribed 2.79 times. However, only 5% of shares set aside for individual retail investors and 2% of those set aside for non-institutional investors were subscribed, according to filings with stock exchanges. IndiGo has allotted 50% of the IPO shares to QIBs. “There has been a drought in the IPO market for a very long time. You’ve not had any good brands at all. Both of these requirements are met with Café Coffee Day and IndiGo, Even then, the retail interest is slow. A retail investor probably comes in when they see successful listing for 2-3 such IPOs," said Manglik. “(Similar IPOs) that come after this, will see more interest. Retail investors tend to follow by example." Manglik pointed out that retail investors also look at absolute prices. “Indigo is selling shares of ₹ 10 face value in the range of ₹ 700-765. If they were selling ₹ 1 face value share at ₹ 70-76, there would have been better retail interest as well," he said.